If you are looking for a sweet, protein packed treat with no nasties, then this is the loaf for you! 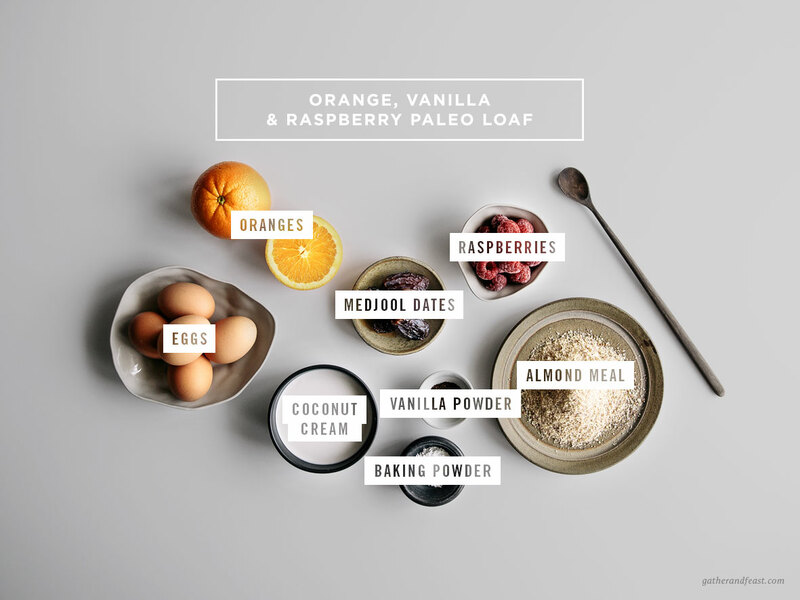 This delicious orange, vanilla and raspberry loaf is easy to prepare, great for work or school lunches, and is the perfect healthy snack for when that 3pm snack attack hits! I was thinking, it would be super easy to adapt this recipe using different flavours. I might try a few new variations over the next couple of weeks; cacao and orange or maybe blueberry, maple and pecan. The options are endless! What flavour combination would you love to see? If you do have any suggestions, let me know in the comments below! Have a great week friends and enjoy! Add the dates, coconut cream and vanilla to a food processor and process until really smooth. This will take a few minutes. Pour the date mixture into a large mixing bowl and add the eggs and orange zest. Then fold through the almond meal, baking powder and a small pinch of salt. Pour the mixture into a paper lined loaf pan. Press the raspberries into the top of the mixture. Remove pan from the oven and let cool for 15-20 minutes before slicing. Enjoy!